Moss This, Moss That: Will Randy Moss Influence Titans Ticket Prices? He doesn’t shine shoes, he doesn’t tape ankles, he doesn’t cut checks. But does Randy Moss affect the demand for tickets? 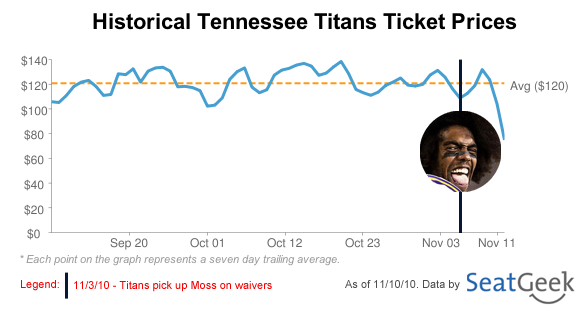 Last week we posted on Moss’ move to the Tennessee Titans, and promised to follow up with a closer look at the ticketing data. 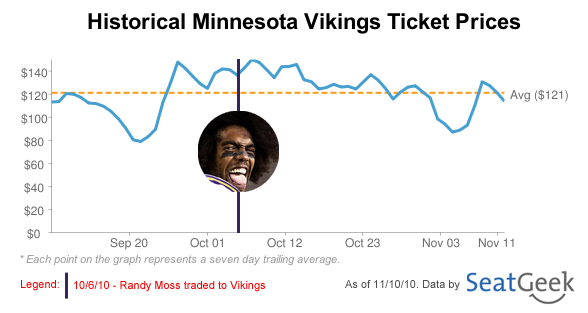 When Randy Moss joined the Minnesota Vikings on October 6th, ticket prices began a steady climb. Fan excitement for his return was evident, or perhaps Minnesotans were really curious to see what antics Moss would bring to their fair city. A trying loss at the Jets on October 11th sent ticket prices stumbling, and couldn’t be repaired by a win over the dreadful Cowboys at Mall of America Field. Prices hit their lowest, after Favre and team failed to topple the Packers, and the tale of a Moss explosion during team lunch sent management into meetings that ultimately decided the wide receiver’s fate. The Minnesota Vikings are currently ranked 15 out of 32 NFL with an season average ticket price of $115 in our NFL Ticket Prices & Rankings. Only four games into Moss’ return to Minnesota, Brad Childress announced that he would be released from the Vikings. On November 3rd, the Tennessee Titans picked him up on waivers, just days after their first loss in three games to the San Diego Chargers. A sharp decline in Titans home game ticket prices is seen after the most recent loss, and looking at upcoming games, it appears that the addition of Moss hasn’t enticed fans enough to pay more. The Tennessee Titans are currently ranked 20 out of 32 NFL with an season average ticket price of $103 in our NFL Ticket Prices & Rankings. Randy Moss makes his debut with the Titans this Sunday in Miami. Although Titans prices haven’t moved significantly since he’s joined the team, we’re expecting his performance this weekend and possible shenanigans over the coming weeks to change that in short time. What do you think about Randy Moss’ 2010 season drama? Will he stay put in Tennessee and help the team to victory? Let us know in the comments or on Twitter @SeatGeek.